I would agree with that in so many ways; I think that more than anybody (for me, at least) , he could capture both the most beautiful and most ugly facets of humanity, in terms of spirit and behaviour, not just outward appearance. Whether he was inspired by the rather unpleasant husband of Miss Edwards we can't know, but I can't imagine he helped matters! Mary Edwards portrait is now hanging in the Frick Collection in New York. A contemporary portrait is that of Captain Corum the founder of the Foundling Hospital who is wearing a bright red coat. Mary Edwards was unusual as a patron as women in that period did not normally commission paintings from artists. Apart from family paintings she also purchased Hogarth's painting of Southwark Fair. For a while I lived in the village of Welham in Leicestershire. The village had been purchased by her father who made his money as a merchant and had married a Dutch woman. The village was largely rebuilt by Francis Edwards in the early 1720's as part of his scheme to bring the road south from Leicester through the village before going on to London, his plan was rejected by the county. The village was described in the Eighteenth Century as having a Dutch appearance on account of it's neat gravelled road and the ornamental canals that flanked the road opposite the houses in the village. Mary Edwards erected a handsome marble monument to her father consisting of a pyramid surmounting a chest tomb, this originally stood in the churchyard and was surrounded by an iron railing, in the corners there were columns with an urn on top. In Nichols County History of Leicestershire it is reported that the monument cost £1,500. The monument was moved to the north side of the church and enclosed in a brick built mausoleum around 1800-1810, as it was not weathering well and suffering from the attentions of small boys. Francis Edwards had remodelled the church as part of his work on the village, but most of his work was swept away by a Victorian restoration. He also paid for a new building for the nearby Kibworth Grammar School. His father had been rector at Kibworth. Mary Edwards relatively early death was hastened by a fondness for Gin. Her inherited wealth which made her one of the wealthiest women in England does not appear to have lead to a happy life. Thank you for that addition; information, how fascinating! I must admit, I do love the line that it was "suffering from the attentions of small boys" - some things never change! I know; another sad tale! Always interesting to hear about powerful women! Thank you for a fascinating article. 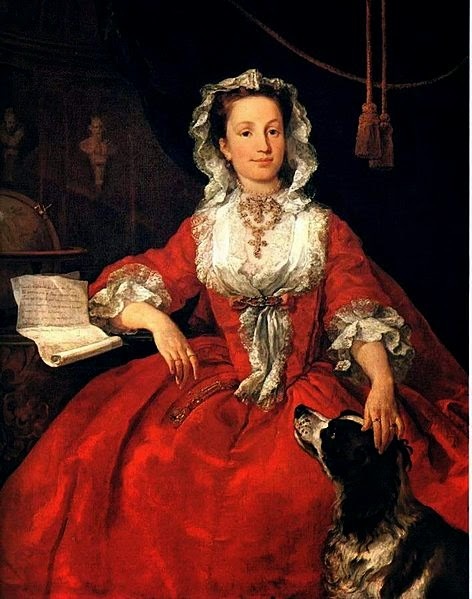 "When the time came to paint Mary herself in 1742, she was thirty seven years of age ... "
"One year after Hogarth completed this lovely painting the lady was dead yet she lives on even now, vibrant, happy and adored, in this remarkable painting." She was ~ 38 - 40 y o ? And what was the cause of her untimely death, please?